Narrowboats vary enormously. They’re all 6’10” wide or thereabouts but any length from twenty to seventy feet, differing depths beneath and heights above the water, different sterns and bows, different internal designs, equipment and heating and propulsion systems. It’s the differences in the last two which have resulted in a rather confusing way of calculating diesel fuel cost. Any fuel used for heating is duty free. Propulsion fuel is not. Unfortunately for the lovely people at Revenue & Customs, most narrowboats use just one fuel tank to store diesel used for both propulsion and heating. Heating includes diesel stoves and central heating systems and running your engine to top up your calorifier’s hot water supply. The diesel seller has no way of knowing what systems you have on board, or what cruising you do or how long you run your engine to charge your batteries and heat your water. Some boat yards insist that you buy your fuel at a 60/40 ratio, that’s 60% charged at the full rate for propulsion and 40% at the duty free rate for heating. Many boatyards allow you to declare your own split, a split which is determined by your own calculations and your own honesty. You can declare all of your fuel at the duty free rate, 0/100, or any other combination you choose. As part of the sale transaction, you will be asked to complete and sign a simple form containing all of your contact details. In theory, Revenue and Customs can use a boatyard’s stored self-declaration diesel sales receipts to track down individual boat owners and assess whether their declaration is valid. What percentage you declare when you buy your fuel is between you and your conscience. Anyway, I didn’t really need any fuel. I have an enormous three hundred and fifty litre tank. I am down to two hundred and fifty litres at the moment so I have more than enough fuel to keep me going until I return to the Shroppie. 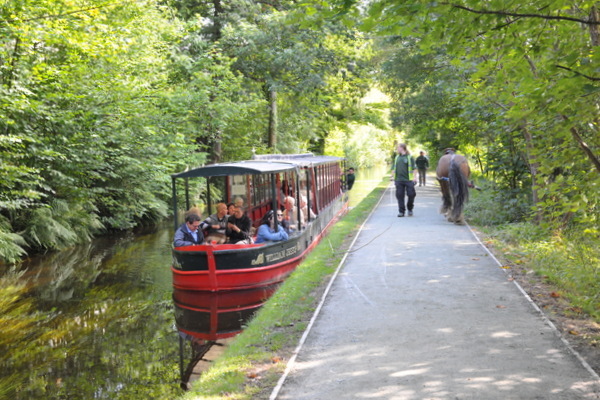 After I sent the newsletter out last Sunday I enjoyed a leisurely stroll from my Blake mere mooring along the canal to the entrance of Ellesmere tunnel then along the A495 to The Mere, a hundred acre lake with a popular café and visitor centre. I sat on a rustic bench for a couple of hours enjoying the sun, the view, my book and a spiced beef wrap cooked on the lake side barbecue. After a leisurely stroll back to the boat, I sat for another hour reading on the shore of Blake mere before retiring to the boat for the day. My only company in this peaceful spot was the occasional angler waiting patiently watching the tips of a handful baited rods hoping to catch one of the monster carp which cruise the deep waters of the expansive mere. Angling is so different from my teenage years when all I carried was a rod in a cloth bag and an Adidas sports bag containing what little equipment I owned and a packed lunch lovingly prepared by my mother. Today’s anglers have it all; tents, comfortable bed frames and sleeping bags, compact stoves, high tech warm and waterproof camouflaged clothing and four wheeled trollies large enough to carry the contents of a modest semi-detached house. The weather on Monday, a bank holiday, wasn’t so kind. I trudged along the canal through heavy rain, followed the short arm to Ellesmere’s canal side Tesco store, stopped long enough to buy the ingredients for my evening meal, and then walked slowly down the high street skirting the odd cagoule wrapped bank holiday visitors trailing strings of bored children. 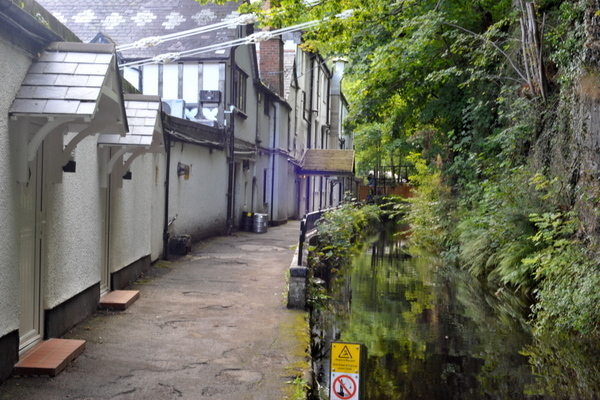 The following morning after three days of boating inactivity I moved on towards Llangollen after three important stops. First was into Blackwater Meadow marina to replace the 13kg propane cylinder which ran out the previous day after two and a half month’s use. I also picked up a bag of coal. Now that the early mornings and late evenings are a little chilly I need to think about heating again. Next stop was along the arm to Tesco. I managed to moor close enough to the store to wheel a trolley loaded with my week’s shopping right up to the boat saving me laboriously packing and unpacking my normal shopping trolley, my seventy litre rucksack. I left my Tesco mooring wearing tee shirt and shorts. By the time I had cruised four hundred metres to Ellesmere’s water and rubbish disposal point, I was wearing an additional fleece top and my bomb proof Guy Cotten waterproofs. Stair rods is the only way to describe the deluge which fell from the sky on and off for the next four hours, but I was snug as a bug in a rug, thoroughly enjoying battling the elements. I Passed Frankton junction and the entrance to the Montgomery canal, chugged on for another couple of hours, rose twelve feet through New Marton locks to the canal’s summit pound and then moored above the flight ready for Chirk’s aqueduct and tunnel the following morning. I have to say that I’ve found the Llangollen quite hard going in places. Up to this point I had briefly grounded on stone half a dozen times and slowed almost to a standstill because of the current when negotiating narrow bridge holes, embankments and aqueducts. Of course, I should just apply a little more power to counter the current but I don’t for two reasons; first is my overheating problem. Cruising at my normal maximum of 1,500rpm is no problem at all. Anything above that results in my engine temperature rising and, to be honest, I don’t know how much of a temperature increase is acceptable. At what temperature do I start damaging the engine? Any input here will be gratefully received. I am also painfully aware that I have a bit of a smoky engine. The faster I go, the more smoke I produce and the more conscious I am of polluting the environment in general and the canals in particular. Is a solution both possible and affordable for my thirty eight year old Mercedes, or do I have to either put up with it or consider finding £10,000 to have my beloved Mercedes removed and replaced with a more modern and cleaner engine? I simply don’t know so, again, I welcome any advice in this area. So, ever mindful of my smoky exhaust, I crawled along Chirk aqueduct seventy feet about the river Ceiriog before crawling again through Chirk tunnel. I didn’t enjoy the passage through the tunnel at all. The current pushed me both back and sideways so I travelled the whole length at an angle trying to stay clear of the offside wall. At least I didn’t have to queue for the tunnel. A line of ten boats stretched away from the northern entrance waiting for their turn as I clawed my way past the entrance. I stopped on the first available mooring after the tunnel. 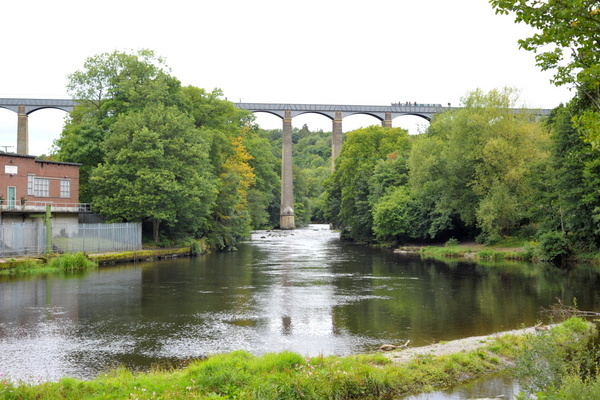 I wanted to moor the boat and walk into Trevor to explore the Pontcysyllte aqueduct and the river Dee beneath. I didn’t know if there would be free moorings further on so I ended up on a gloomy and very wet and muddy mooring in a dank cutting close to the railway and a large factory. I had the pleasure of listening all night to the clanging of steel and electric powered fork lift trucks with their high pitched reverse alerts. It wasn’t the tranquility I craved. As is often the case, I was wrong. 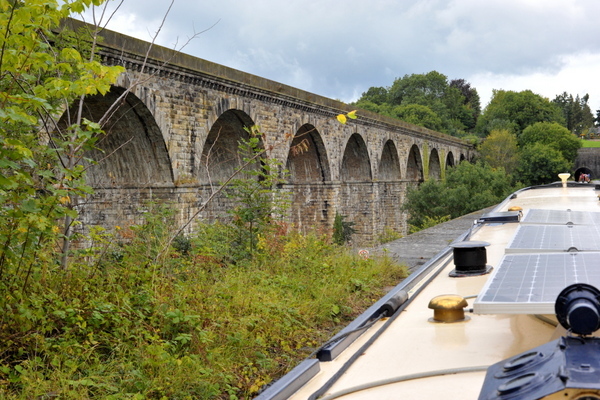 As I discovered on my walk the following day, the stretch between Chirk tunnel and Pontcysyllte aqueduct has plenty of dry, scenic and quiet moorings. I enjoyed the varied scenery for three and a half miles into Trevor, stopping for half an hour to watch a stream of boats squeeze themselves a thousand feet along the boat width steel trough suspended, and unprotected by a guard rail on one side, a hundred and twenty seven feet above the turbulent river Dee. I stopped for a bite to eat at the canal side snack bar next to the aqueduct and paid £7 for the world’s smallest ham baguette and a luke warm cup of coffee. Such is the price of visiting popular tourist destinations. There’s a well marked path leading down from the aqueduct to the river beneath. Minutes after leaving the busy aqueduct behind I had the river completely to myself. I sat for half an hour with a wonderful view of the aqueduct’s full span, calmed by the river’s racing water but disturbed by a growing dampness in the trouser region. Note to self; avoid sitting on wet rocks. Crossing Pontcysyllte aqueduct – Mind the drop! Enlivened by the thought of another twenty six years active boating before reaching Hilda’s age I marched happily back towards the boat on a pleasant but uneventful walk apart from the sight of some jaw dropping irresponsibility on the part of a family of holiday hirers. 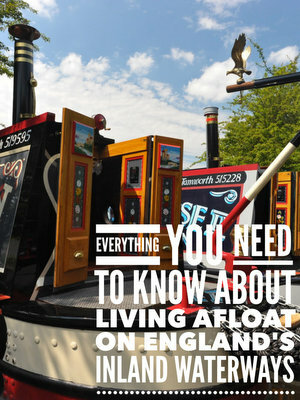 I watched a Crest Narrowboats hire boat, sixty plus feet in length, weave erratically along the canal towards me bouncing from bank to bank. As the boat drew closer I could see two young boys on the cruiser stern. The elder boy, twelve at the most, was at the helm playing a game with what I assumed was his younger brother. The game was an athletic test for the younger ten year old. As the boat swerved close to the towpath, the elder encourage the younger to jump from boat to bank, then back on to the boat again as it moved away. Twice while I watched he almost failed, once landing in the water with his trailing leg. As the boat drew level with me I saw four adults contentedly sitting at a table laden with food and several half empty bottles of wine. I watched the boat for five minutes until it weaved around a bend out of site. The children remained at the helm while the adults enjoyed their lunch. After a late breakfast the following day I cruised for an hour to the aqueduct then spent a thrilling five minutes crossing the gorge. What a wonderful feeling crossing so high above the river with no railings on one side to spoil the view. I was wondering if I would feel nervous or exposed with an unprotected one hundred and twenty seven feet drop on one side. I actually felt very safe, so safe in fact that I spent much of the journey with both hands on my camera. The trough is so narrow that it steers the boat for you, allowing you all the time in the world to enjoy the experience. I particularly enjoyed the stretch above the river where the boat and I were buffeted by the wind channelled through the valley. The view along the river and the forested valley sides was spectacular. After the all too brief crossing I was in Trevor. The route to Llangollen continued at a sharp left hand turn, but I cruised past it, then past the Anglo Welsh hire boat, squeezing through a boat width gap between their hire fleet and three day boats to the arm’s Y shaped terminus. The left hand fork was occupied by Jones the Boats but there was space enough for four or five boats to moor on rings on the right had fork. I turned the boat in the seventy feet winding hole at the fork then reversed back the narrow channel and on to the only free mooring. It’s a wonderful spot. 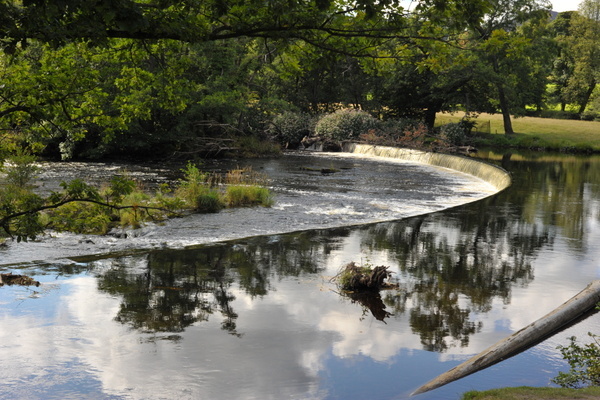 Because it’s at the end of the arm, there are no boats passing to spoil the tranquillity and the mooring is ideally situated for exploring the area or, in my case, to use as a base for exploring Llangollen and the Horseshoe Falls. I set off on my hike to Llangollen at midday on Saturday. 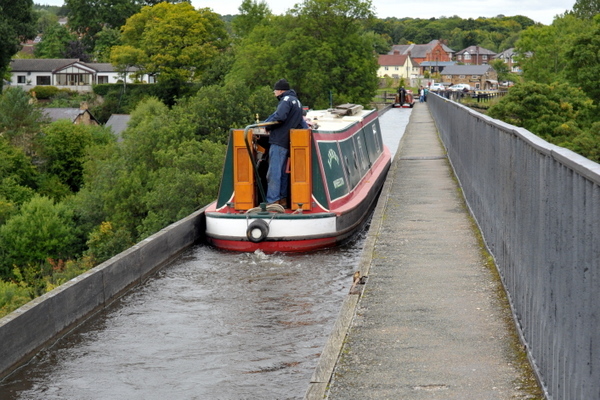 This stretch of the Llangollen canal is very narrow. I was walking the route because I had been told or read, I can’t remember which, that boats with more than a 20” draught struggle to reach the end. As mine is 30” I didn’t want to take the risk. However, I didn’t see any evidence of any boats struggling with the depth during my five hour walk, but I’m pleased I didn’t take the boat. I was able to enjoy and appreciate the spectacular scenery without worrying about the three narrow, single boat width sections where boaters are advised to send a crew member to walk ahead to check for traffic. Obviously I couldn’t do that on my own so negotiating the narrows would have been a bit of a lottery. For most of the day there wasn’t much traffic on the canal at all. The first boat I met, a Black Price hire boat, was cruising much, much too fast. They were pushing a six inch high bow wave before them as they surged towards me, producing enough wash to actually break over the towpath. 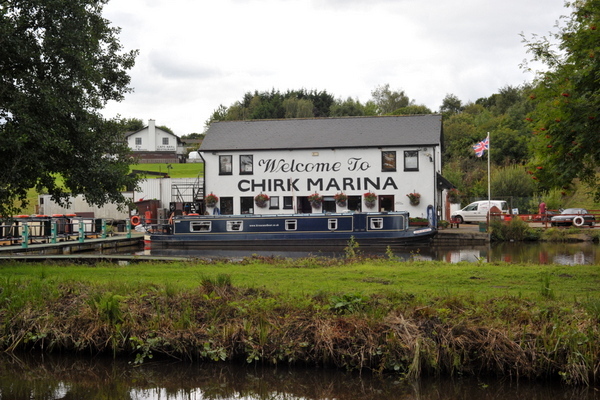 The route is a wonderful walk apart from the towpath’s close proximity to the busy A5. 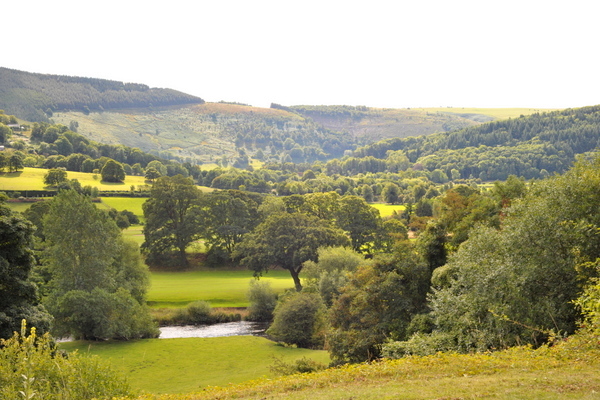 Heavily wooded slopes rise away from the valley and the river Dee towards towering limestone peaks. The tree lined stone lined canal clings to the valley side, narrowing to single boat width at three different stretches while it squeezes past rocky outcrops. The canal here is close to my childhood home. Birkenhead is just thirty miles away as the crow flies, the rural camp site where my parents owned a static caravan when I was knee high to a grasshopper just ten miles away and the weekend destination for my frequent escapes from a troubled marriage, Smowdonia, just forty miles away. This area of the network feels like home. The crew of an Anglo Welsh day boat must have thought so too. They were tied securely to a lift bridge landing bollards while they enjoyed an extensive and lengthy banquet on the boat’s front deck just fifty feet away from a long and empty line of visitor moorings. 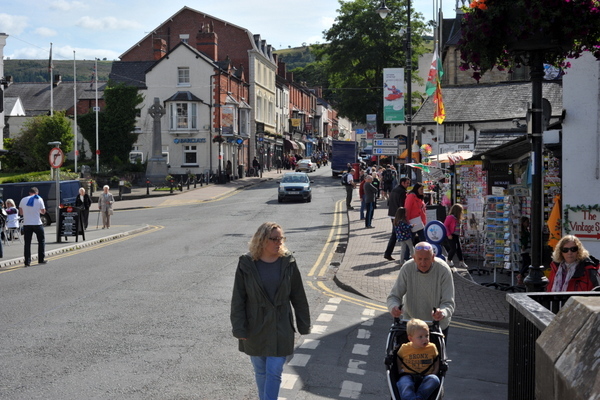 Llangollen is a busy little tourist destination with its canal, river and steam railway. I sat on the bridge over the river to eat my lunch bought from a high street delicatessen then set off on the two mile hike to Horseshoe Falls and the end of the feeder canal. The falls, though not terribly impressive as far as waterfalls are concerned, they’re there purely to divert twelve million gallons of water a day into the canal network, are a beautiful spot to stop for a while to enjoy the tranquil sound of running water. 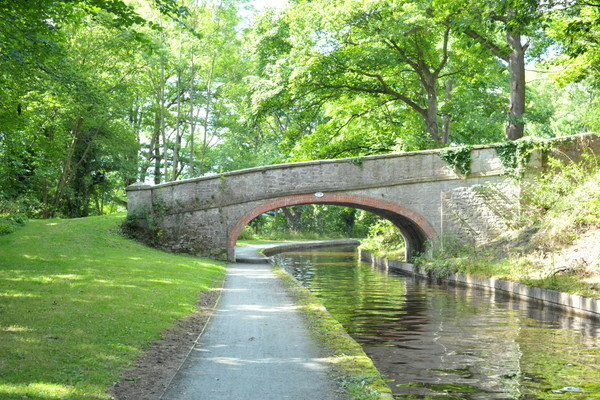 The canal ends here but there are miles of wonderful riverside walks to explore. Unfortunately I was six miles away from the boat already so I didn’t have the time or energy to walk any further. After laying on the riverbank in the sun for half an hour I set off on the two hour walk back to the boat, stopping briefly to chat to a young and shy CRT volunteer trying to drum up support for CRT’s “Friends” scheme. Friends pay a regular monthly £5 and upwards subscription to the charity to help maintain the network. I told him I was already a member, rolled up my left trouser leg and offered him the Friends’ secret handshake. He gave me a look normally reserved for those who have escaped from a secure institution then turned to another passer-by. I stopped close to the volunteer to admire the view and overheard a man talking to his wife as he passed me. “These charity thing is all a load of b****cks,” he aggressively told his long suffering wife. “The money never gets to where it’s needed so there’s no point in donating in the first place!” He paused for a moment then exclaimed, “Isn’t this canal beautiful!” Yes, it is mate, but keeping it that way takes money, lots of it, so maybe donating isn’t such a bad idea after all! Soon after I skirted a man bent over his wheelbarrow busy clearing the towpath of the inevitable mounds of manure courtesy of the barge pulling horses along this short stretch of canal. Maybe I’ll stick with my smoky diesel engine. I stopped briefly at the café next to the Horse Drawn Narrowboats terminus for a sliver of concrete hard quiche and a cappuccino. A scouse couple, on a day out celebrating their anniversary, sat next to me. For half an hour he sat quietly digesting the contents of a series of local guides while she sat with a menu on her head protecting her much cherished make up from the heat of the unwanted autumn sun. At 6.30pm, footsore but supremely happy after a thirteen mile walk through some of the most stunning scenery the canal network has to offer, I arrived back on my tranquil mooring ready for another peaceful night in Trevor. I’m staying here tonight too. After I send out this newsletter I’m going to spend a couple of hours exploring the banks of the river Dee before I start my one hundred and forty six mile, ninety three lock journey back to my Napton Junction base tomorrow morning. The earliest dates are now at the beginning of October. If you want to see the available dates for October onward click here.